OLD MILL CREEK, Ill. (June 7, 2016) Tempel Lipizzan‘s stallions return for a 29th summer to present the classic equestrian sport of dressage, a live, awe-inspiring 90-minute program of synchronized movements, athleticism and harmony between horse and rider set to classical music. 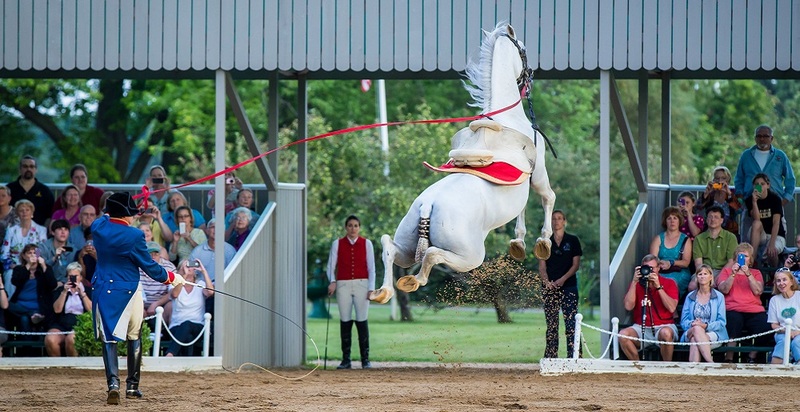 The 2016 Tempel Lipizzans summer season kicks-off Sunday, June 19 at 1pm with performances continuing through Sept. 11 on select Sundays, Wednesdays and Saturdays at Tempel Farms in Old Mill Creek, IL, just north of Chicago. The live, outdoor program follows the horses’ training progression from newest foals, frolicking around the arena, to the precise power of young stallions, to the refined grand finale of “Quadrille: Ballet of the White Stallions,” in which four highly trained adult horses perform difficult, dance-like movements in exquisite unison. Performance highlights also include the gravity-defying, military-style “Airs Above the Ground” leaps of “The Capriole,” “The Courbette,” and “The Levade” in which few breeds outside of Lipizzan are able to perform. In honor of Rio 2016, the Lipizzans will also demonstrate a “Tribute to the Olympic Sport of Dressage,” a musical freestyle as one would see in the upcoming Summer Olympics. This year’s “The Pas de Deux,” or ballet for two performed by intermediate-level stallions, will be set to the sounds of Star Wars: Episode IV. Following each performance, guests are invited to enjoy a self-guided tour through the stallion stable to meet the equine stars and ask questions of Tempel Lipizzan riders, trainers and working students. On July 29th and 30th, famed Olympic Trainer and Chief Rider of the Spanish Riding School, Andreas Hausberger comes to Tempel Farms to coach the team and local dressage professionals and visitors will have the chance to participate in a Q&A with the trainer. Evening performances create the ideal date night out with the show at sunset and two complimentary glasses of wine per ticket; Tempel Farms’ outdoor café opens for lunch at 11:30 a.m. on performance Sundays and Wednesdays, and at 4:30 p.m. on performance Saturdays for dinner and drinks. Advance tickets start at $27 with discounts for children under 15, active military personal and veterans. For more information and to purchase tickets, visit www.tempelfarms.com or call (847) 244-5330. In 1958, Chicago industrialist Tempel Smith and his wife, Esther, began a year of highly sensitive negotiations with the Austrian government to import 20 Lipizzans to America. Tempel Farms soon became home to the largest privately owned herd of Lipizzans in the world. Over the past 57 years, there have been more than 900 foals born at Tempel Farms, which remains one of only a few places in the world where rare Lipizzan horses are bred, trained and perform on the same property. In 1997, the owners were awarded the Officers Cross from the Austrian Government for their careful preservation of Austrian culture in the United States.